“ordinary people (have) power….when they rise up in anger and hope, defy the rules….disrupt (state) institutions….propel new issues to the center of political debate (and force) political leaders (to) stem voter defections by proferring reforms. These are the conditions that produce” democratic change. Another example is corporate credits like airline frequent flyer miles entitling holders to free flights and other benefits like lodging, rental cars, restaurant meals and even groceries. Computer technology provides other alternatives as well, without currencies, by facilitating trades electronically. In 1981 after IBM released its XT computer, the first electronic currency system was devised – a Local Exchange Trading System (LETS) for recording transactions and keeping accounts by simply having “an information system for recording human effort.” It tallied credits in and debits out, tax and interest free, and stored electronically. The main drawback to these systems is they’re small, local, and fail to address the greater problem – “the mammoth debt spider that is sucking the lifeblood from the national economy” and our well-being. Solving that requires national currency reform – returning money creation power to the people who own it from bankers who stole it. — Greenbackers called scarcity a drawback letting governments condone “dishonest” money through fractional reserve banking; they’d be harmed too many previous times not to know it; also, during the 1850s Gold Rush, its supply and consumer prices rose sharply, did again from 1917 – 1920, and during the 1970s when gold rose from $40 an ounce to $800 and inflation along with it. The debate still continues, but today’s goldbugs are money reformers, not bankers who have it all going their way so why change. As a medium of exchange, gold has serious drawbacks. In the Great Depression, it left the country, exacerbating deflation that caused the money supply and demand to contract. Another problem is that productivity is linked to its availability, but more practical matters are also relevant like needing gold bars for large purchases, something avoided by paper, checkbook and electronic money. In the 1990s, Harvey Barnard proposed a new currency reform idea that included a national sales tax in lieu of the federal income tax with the aim of zero inflation and a stable economy. The National Economic Stabilization and Recovery Act (NESARA) he called it. His idea was for the government to issue currency in three forms – standard silver coins, standard gold ones, and Treasury credit notes or Greenbacks. Treasury notes would replace Federal Reserve ones with the Federal Reserve abolished. NESARA was never introduced in Congress and might work if enacted. But why bother when the central problem is more simply addressed by returning money creation power to the government as the Constitution mandates. Paper currency isn’t the problem. A private banking cartel controlling it is what’s at issue to fix. By doing it, “the water of a free-flowing money supply can transform an arid desert of debt into the green abundance envisioned by our forefathers.” It’s there for the taking by simply “eliminating the financial parasite that is draining our abundance away,” and there’s nothing complicated about doing it. However, two centuries ago, Alexander Hamilton showed “that Congress could dispose of the federal debt by ‘monetizing’ it, but Congress made the mistake of delegating that function to a private banking system.” It can fix it by “buying back its own bonds with newly-issued US Notes” it can print in limitless amounts – debt and interest free. It’s being done now – “not by the government but by the private Federal Reserve.” However, doing it leaves the bonds in circulation, with two sets of securities (bonds and cash) instead of one. “This highly inflationary (scheme) could be avoided” if the government just bought back its own bonds and voided them out – a win-win arrangement for the nation and public with only bankers losing out as they should. It’s simple to do and would be able to “extinguish the national debt with the click of a mouse.” In January 2004, the Treasury did it when it “called” (paid off) a 30-year bond issue prior to its due date. Paying “in book-entry form” eliminated doing it with paper currencies or checks and turned securities from interest-bearing to non-interest bearing ones. Bondholders had a choice. They could take their redemption amount in cash or not sell and get no interest. By this method, the Treasury “can pay off the entire federal debt….It just has to announce that it is calling its bonds and other securities, and that they will be paid ‘in book-entry form.’ ” No cash is involved and funds received can be otherwise reinvested. The process can be accomplished gradually as securities come due. It’s just a matter of doing it along with restoring money creation power to the government and making America democratic again, unbeholden to bankers. “Inflation results when the money supply increases faster than goods and services, and replacing government securities with cash would not change the size of the money supply.” If government buys its own bonds, they simply convert from interest-bearing notes into non-interest-bearing legal tender (cash). The money supply remains unchanged, and there’s no inflationary impact. It’s also a way to solve the “Social Security crisis.” Resolve it by “simply cashing out (of) federal bond holdings (in exchange for) newly-issued US notes” with no inflationary effect because no new money would be created. Bonds would become cash, remain in the fund, and be used for future pay-outs. Fed-held securities could be cashed out the same way and just as benignly. Cash would replace bonds. They’d be voided out. The money supply would be unchanged, and inflation would be avoided. It would work no differently for foreign central bank held debt since bonds and cash are the same thing and either can be held in reserve to support their own currencies or to buy oil per the 1974 OPEC agreement. Already sovereign debt holders are cutting back, reducing their US securities reserves but doing it discretely so as not to be disruptive. However, “the tide is rolling out, and US bonds will be coming back to (our) shores whether we like it or not.” At issue is who’ll buy them and whether an inflationary or non-inflationary path will be taken. So far it’s the former with all the dangers involved. Early in the new millennium, deflationary concerns were great enough for Ben Bernanke to deliver a Washington 2002 speech titled: “Deflation: Making Sure ‘It’ Doesn’t Happen Here.” He explained that lowering interest rates isn’t the sole way to inject new money into the economy. The “US government has a new technology, called a printing press (an electronic one), that allows it to produce as many US dollars as it wishes at essentially no cost.” The government could reflate the economy and buy hard assets at the same time. At issue again is whether government or private bankers do it (or local communities acting independently) and the positive or negative effects of each choice. 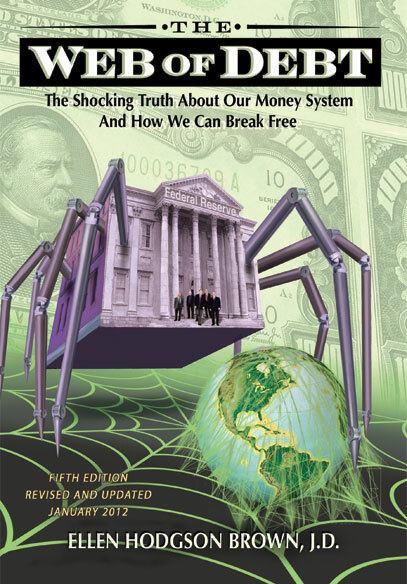 Imagine the difference if the “banking spider….could be decapitated, returning national (money creation) sovereignty to the people themselves.” In other words, the rightful owner. A final article addresses a people-oriented banking system.